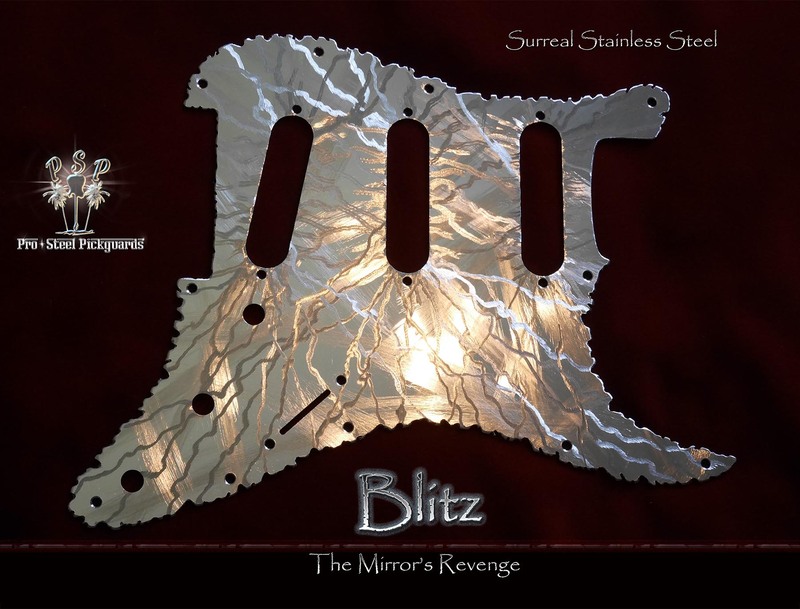 See the multi photo Facebook post - Blitz Strat chrome pickguard. Tasty carved edges with detailed hand finishing for smooth edges, and the playing surface polished smooth to touch. With surface flashes savaged permanently into polished mirror stainless steel, leaving scattered sections of mirror remaining. Killer light reflection dynamics within surface flash array. Also more effective in low light, stage, or night. All edges and surface have been smoothed to touch. 100% non-magnetic stainless steel, corrosion free. NOTE: The exact Blitz in this photo has found a new home. Each Blitz is made when you purchase. Signed, numbered and dated on rear of each guard. The Blitz series is a hand made art-form, therefore each Blitz, although similar, will be uniquely perfect by small variations in each guard. * The Blitz guard can be requested from nearly any variations of our current stock pickguards, eg. Floyd Trems, Tele's, Charvel, G&L etc. Just use the Contact Us to email (top left of page) with your guard preference. Single slots will fit all Strat single coils, rails or Lace pickups. Fits - Any genuine Fender USA & MiM Strats from 1986 to present. Any Strat which a current Fender Strat guard fits. Before '86 there may be deviation in some Fender screw hole placements. If you need a hole for a Strat Mini Toggle Switch let me know. I can do this free of charge.